The goal of this ELU funded project was to use QMPlus Hub to support students’ group-based coursework for the “Interactive Media Design and Production” module. For their coursework, the students are required to plan, design and then prototype a small multimedia application using Flash. The students follow a design process made of 3 phases and 9 sequential tasks. This involves conducting brainstorming sessions, collaboratively drawing mind maps and writing storyboards, sharing multimedia resources and coding. A template designed using QMplus Hub will allow students to collaborate and submit their group coursework. For the module “Interactive Media Design and Production” (EBU5305) taught in Beijing on the QMUL/BUPT joint programme, students are required to plan, design, and then develop (in Flash) a small interactive multimedia application within a team of 5 students. Each application is a small learning tool, which explains and demonstrates a concept, a principle, a process, or an algorithm that students learnt during the course of their studies and that they are free to select themselves. Students are required to follow a “design process” which is made of 9 sequential steps (from “determining the goal of the project” to “building a prototype”). Each step involves a number of group activities, such as a brain storming session, drawing of a mind map and writing and drawing of a storyboard. Parts of the work also need to be assigned to individuals and distributed among the members of the team (e.g. the creation of multimedia resources and the coding in Flash of the interactive parts of the application). monitor individual engagement in the group activities. Supporting collaboration. Multimedia productions require high levels of interaction and collaboration within the production team (e.g. brainstorming and mind-mapping sessions, production and exchange of audio-visual data, building of storyboard animations, etc.). Recently, the module has been victim of its own success with an increasing number of students subscribing to it (180 students in the 2015 autumn semester), making any group activity happening in class increasingly difficult to organise. The project will help us understanding how such group activity can actually be supported on QMplus Hub and how records of collaborative work sessions can be generated. Building an online portfolio. The aim of the portfolio is to monitor progress and collect all the students’ productions. Currently, students are required to fill in and submit at regular intervals (4 times in the semester) a “design document”, which is a .doc file where they answer questions and paste images of their mind maps and screenshots of their designs. An E-Portfolio on QMplus Hub would allow them to add videos, sound files and Flash animations. It would also allow students to give and receive peer feedback on their productions. Monitoring individual Engagement. As for every group work, it is difficult to measure the amount of work each individual contributes to the group. By being able to monitor individual engagement (e.g. frequency of a student’s visits to the group area, number of resources uploaded, etc.) the objective would not be so much to differentiate marking, but to encourage students who contribute less than others, and be able to spot students completely disengaged with the group. log their contributions to the group work and ask questions. Flexible text blocks where students will write their group comments on the work done (e.g. how they identified the target audience for their application). A feedback block for the lecturers and teaching assistants to provide feedback on the page contents. Image blocks for uploading mind maps, diagrams, etc. An image gallery for uploading thumbnails, screenshots of the application prototype, etc. All pages are accessible (with edit rights) to the team, the lecturers and teaching assistants. The purpose of this part of the project was to identify external tools for brainstorming, mind mapping and storytelling activities and provide links to students on the appropriate pages. 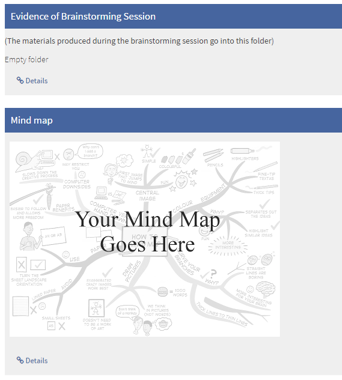 We identified two external tools for brainstorming and mind mapping; the links are included in the external resources blocks in the relevant pages. In addition, we created a storyboard template in Word which can be download and used by the students for storyboarding. These content can then be added to the QMplus Hub pages. The purpose was to track group and individual contributions to the coursework. This is done using group forums, a feature within QMplus Hub. Each team has their own discussion forum. Teaching assistants who monitor the forums will create one topic per task in the forum and students will add their comments on each task under the relevant topic. The purpose was to allow students to provide and gather peer feedback on the best multimedia applications produced by the students throughout this coursework. The page containing the embedded Flash file will be shared with other teams and students can leave their comments in the feedback block included in the page. In addition to QMPlus Hub’s user manual, several user manuals were created for the students to guide them through tasks such as creating and joining a group, editing text and image blocks and uploading their prototype in Flash format.